Guest blog by Nicole Pontius from Camcode. 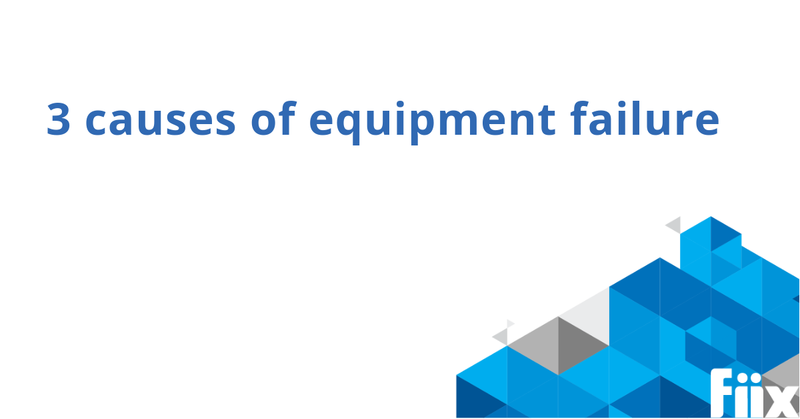 Equipment failure is a common problem for many organizations. Depending on repair costs, total downtime, and subsequent impacts on the production of goods or delivery of services, equipment failure can have devastating and far-reaching effects. Not all equipment failure falls into this category, of course; many malfunctions and broken parts are easily rectified and result in minimal losses. However, without proper planning, maintenance, and monitoring, your next equipment failure could be catastrophic. There are several common causes of equipment failure, and understanding why your equipment may be failing is the first step in taking preventive measures to avoid serious consequences. Equipment operators typically receive in-depth training on appropriate operating procedures, basic troubleshooting, and best practices for safe equipment use relevant to the machines they’ll be working with. However, the day inevitably comes when an operator ends up working on a machine that they haven’t been adequately trained for. Sometimes this situation arises as a result of short staffing or unexpected absences. Other times emergencies come up that require prompt remediation with available staff–who don’t necessarily have the level of expertise that your most experienced operators have. One solution to these problems is to ensure that you have enough trained operators (ideally, more than you need) to allow for some flexibility and a contingency plan for staff shortage emergencies. If possible, all of your operators should have some training even on every piece of equipment—even assets they don’t typically work with. Most importantly, never allow an operator to use equipment they are not qualified to run. Not only will this help to reduce operational errors, but in some industries, it’s imperative for regulatory compliance. The Occupational Safety and Health Administration (OSHA) sets regulations for operator training requirements for certain types of equipment and for general occupational safety. It’s up to you, however, to know the regulations applicable to your industry and ensure that you have adequate compliance procedures in place. Most equipment requires regular maintenance for optimal performance, but too often, preventive maintenance is the first task to go when you’re short-staffed and overwhelmed. It’s easy to brush off regular maintenance when things seem to be running just fine, and many companies work under the assumption that experienced workers will identify impending trouble before equipment fails entirely. That said, many of the subtle signs of slowing performance or the early stages of failure aren’t easily detectable and often go unnoticed, or worse, workers implement temporary fixes (sometimes described as “band-aids”) to maintain production in the short-term. Band-aid fixes almost always make the problem worse over time. In other cases, companies simply lack efficient planning methods for ensuring that ongoing maintenance is performed. Tracking equipment and machinery with asset tags can help to keep maintenance schedules on track and equipment operating at maximum operational efficiency. Reductions in downtime by up to 75%. The bottom-line benefits are impossible to deny. Preventive maintenance should be a priority for all companies engaged in equipment operations. Beyond conducting regular preventive maintenance, continuous equipment monitoring is a beneficial process that can result in dramatic reductions in breakdowns and subsequent downtime. Continuous monitoring makes use of sensors to establish baselines and detect subtle changes in factors like vibration, which can be used to predict impending breakdowns and failures, often allowing more time for contingency planning and scheduling downtime for equipment to minimize production interruptions. Continuous equipment monitoring falls under the umbrella of predictive maintenance, which aims to detect changes in the functional state of equipment. In turn, companies can identify the causes of increased stress on equipment or machinery and adjust workloads and schedules to lessen the load on machinery showing early indicators of impending failure. Predictive maintenance is different from preventive maintenance in that rather than perform a set of tasks (such as cleaning, oil changes, tune-ups, etc.) on a pre-determined schedule, it evaluates the actual condition and operational status of equipment in real-time, detecting subtle changes that go unnoticed even by the most experienced operators and skilled maintenance professionals. Equipment can be unpredictable, and eventual failure is inevitable. But by ensuring adequate operator training, planning for appropriate staffing levels based on operator needs, and implementing preventive and predictive maintenance strategies, you’ll keep your equipment running at optimal performance and benefit from a longer lifespan from your most valuable assets.